“Arminisaurus is significant because it dates from a timeframe early in the Jurassic, during which we have very few identifiable plesiosaur fossils,” said researcher Benjamin Kear. 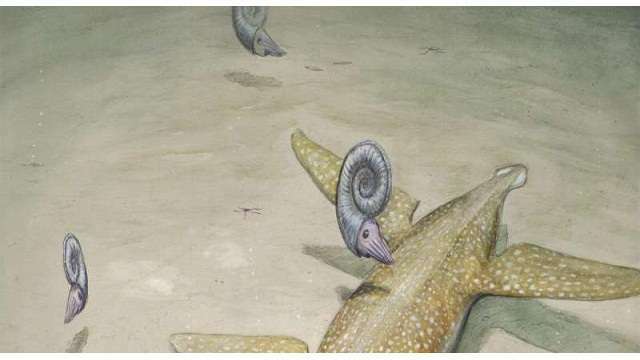 Researchers have identified a new long-necked marine reptile species of the early Jurassic. The 190 million-year-old bones were first discovered in the early 1990s, but only recently identified. The species was an relative of pliosaurids, a group of super predator plesiosaurs that dominated the oceans during the Jurassic period. Sachs and his colleagues named the new species Arminisaurus schuberti after Arminius, a chieftain who led a group of Germanic tribes to victory over the Roman legions at the Battle of the Teutoburg Forest in 9 A.D. Compared to its relatives, Arminisaurus is relatively small, measuring 3 to 4 meters, or 10 to 13 feet. Mining machinery crushed many of the specimen’s bones, but enough of the fossil remains were left intact — including the skull, vertebrae and limb bones — for Arminisaurus to be identified as a unique species. Though smaller than its later relative, researchers were able to identify several anatomical parallels between Arminisaurus and pliosaurids.